The view from Dune 7 is spectacular. At a height of 385 m (1,260 ft), it is the highest sand dune in the world. Imagine you are an acacia tree in the Namib Desert – gnarly, thorny and old and you don’t want antelopes and giraffes to eat your fresh, green leaves. What do you do? First of all, as soon as an antelope starts munching on your foliage, you produce bitter leaf tannins. Within 15 minutes your leaves will be non-edible and toxic. Then, being a good citizen of the Namib, you may want to alert your neighboring acacia trees. You do that by releasing ethylene into the air. Carried by the wind, it warns the trees downwind to step up their tannin production in advance of the antelope attack. Good plan, but it won’t work! The antelopes already know this trick and start eating the acacias upwind from you! However, tannins and ethylene are not the only tools in your tree species’ toolbox. After all, you still have your trusty biting ants using your swollen thorns as nesting sites and collecting sweet nectar from the base of your leaves. In return for your generosity, the ants act as your body guards. They bite and hurt any large herbivore trying to eat your precious leaves. But what happens when the herbivores die out or become greatly reduced in numbers? Since you no longer need the body guard ants for protection, you stop making sweet nectar and cause the “good” ants to leave. Subsequently, “bad” ants invade your branches! They are not interested in your sweet nectar or your swollen thorns but they help wood-boring beetles create tunnels which the ants use as nesting sites. This is your death sentence. Within 5 to 10 years, you are fire wood. And so, the morale of the story is this: don’t hunt acacia-eating herbivores if you want acacia trees to survive in Africa! The above is a great example of the perplexing interconnectedness of ecosystems. The Namib Desert is the third driest place on earth and at 55 to 80 million years of age it is the oldest desert in the world. Evolution must have had fun in this place! From lichen that grow 1 mm per year and get only nourished by the fog rolling in from the ocean, to 2,500 year-old Welwitschia plants that get pollinated by a red beetle running back and forth between the male and the female plants, the Namib is (aside from the Galapagos, perhaps) THE place to study ecosystems and evolution. “One hundred years ago this desert was full of lions, elephants and giraffes” said Erwin as he steered our four-wheel drive along a dried-up washboard riverbed. “Now, the desert belongs to the Oryx, antelopes, reptiles and the wild horses.” “What happened?” I inquired. “Hunting and climate change”, Erwin responded. “One hundred years ago, the desert wasn’t as dry as it is now.” I close my eyes and try to envision this moonscape filled with animals. It’s tough to do after the area has only seen 14 mm of rain during this last year. Everything is gnarly, brown and harsh looking. How can anything survive in this environment? I wonder how many acacia trees have died during the past hundred years. The landscape of the Namib is breathtaking; this desert is a wild place. It stretches along the west coast of Namibia for 1,900 km (1,200 mi), reaching 50 to 160 km (30 mi to 100 mi) inland. Aside from the moonscapes and the grass steppes you can also find the world’s highest sand dune in the Namib. 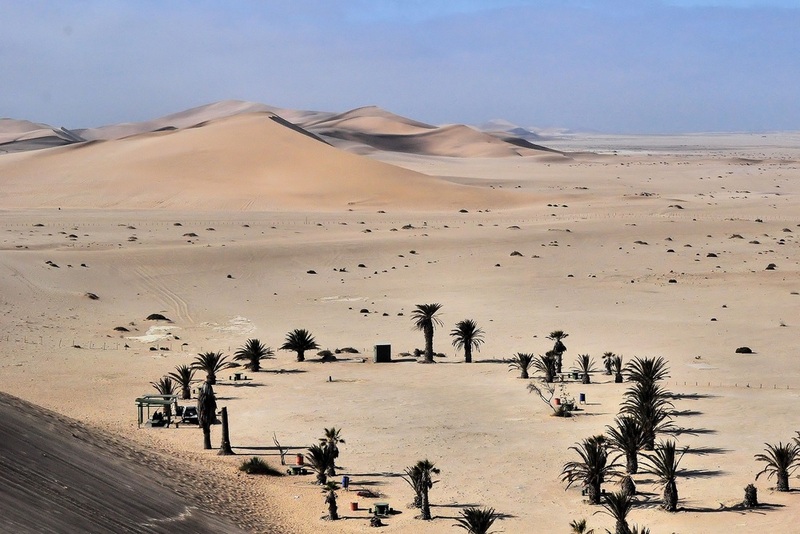 With over 350 m (1,150 ft) in height, Dune 7 (the dune is 7 km from the town of Walvis Bay) used to be the military’s favorite exercise “facility”. During training exercises, the soldiers had to carry their heavy backpacks up and down the dune’s steep incline. True to my German heritage and in honor of Namibia’s German past (Namibia used to be called “German West Africa”), I decide to climb Dune 7. After taking the easy route to the top, I am awe-struck by the sight before me: sand as far as the eye can see! A number of people are watching me from below. I am the only one up here on top. Should I return the same way or charge down the steep incline back to the parking lot? Standing on the top ridge of Dune 7, I feel like a child in a giant sandbox and plunge forward into the deep and sandy abyss. With a doubt, it’s hard to look dignified while having so much fun! When I reach our car at the bottom of the hill, huffing and puffing from exertion, I have a huge smile on my face. I doubt the Namibian soldiers had as much fun on Dune 7 as I did!